Bungee Jumping is an extreme sport that involves making a jump to the void from a considerable height, from a bridge, a platform or a crane, usually with a connection from the ankles to an elastic rope, which allows, first, to fall accelerating, then cushions the fall and finally, cause rebounding. It is practiced all over the world, Spain has many places where Bungee Jumping is usually practiced. If you embark on a trip through Latin America, you can also find great landscapes to do Bungee Jumping, in the Cabra Corral Dam in Argentina, for example, in Colombia you can visit the Guavio Dam, or the bridge of the Chiche River Canyon in Ecuador. 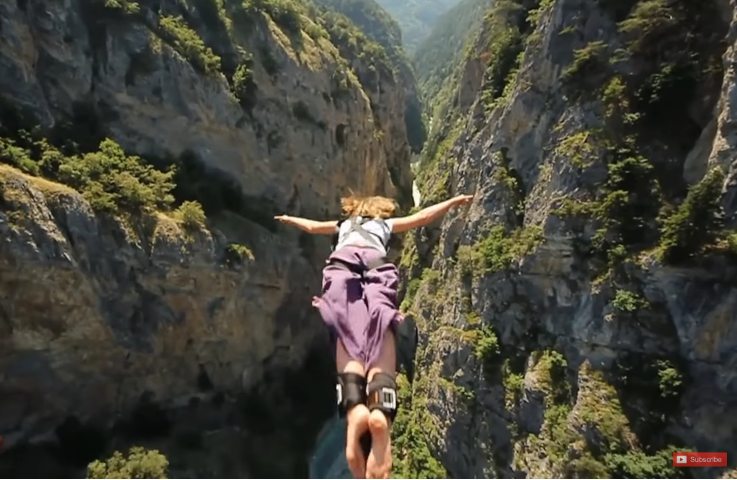 The experience in Bungee Jumping, is very exciting, on the one hand because it consists of jumping into the void, but unlike paragliding, the free fall will depend on the length of the elastic, once you get to the bottom, you will appreciate the sensation of weightlessness that is felt in the rebounds. It could be thought that the emotions in skydiving would be more intense, since the free fall is much greater, but the proximity of the speed of the fall in the Bungee makes this experience something transcendental, much more charged with adrenaline. And if you dare to jump back, the experience is even stronger, because the feeling of free fall not seeing where we are going, increases the fear, and that is usually noticed in the expression of the face. However, if you have not yet tried it, we do not recommend that you start with a jump back, because it increases the temptation to jump standing. The more difficult the challenge, the greater the satisfaction in overcoming fear, gives us much more pleasure. But if you already experienced the Bungee Jumping, and you want to feel something really great, you can try the Elevator, or Standing Jump, it is even more radical, because the feeling of emptiness in the entrails at the moment of beginning the fall, gives the impression that your stomach rises, also allows you to appreciate more accurately the speed of fall and rebound, it is a very different experience to jump hanging from the feet. But you must be extremely careful, because in the Standing Jump, the rubber can hit you when tensed, so that position is not advisable except in the pendulum, and only in some bridges in particular, which offer the right width (not deficient nor excessive) to be able to bounce safely. Like all extreme sports, bungee jumping, properly installed and performed, is a low risk activity that can be very safe, if you use the corresponding safety measures, otherwise it can be an extremely dangerous sport, and of course there are risks. The biggest risk in this sport is jumping badly or getting loose from the railing, but falling on your feet is the most common. In those circumstances who jumps falls from foot until stretch the rubber, and the change of position is very abrupt, because the connection goes to the feet.